Manila, Philippines – On September 21, 2012 Marcial Law Day, an exciting event will be held at the Cuneta Astrodome, Manila promoted by Anson Tiu Co of Shape up Boxing Promotions in association with Sammy Gello-ani, an special event dedicated to his fallen boxer Karlo Maquinto who had past after a bout he had won against Marc Joseph Costa. “This is a way of paying homage to him and fighters like him, whose careers were snuffed out too soon,” said Anson Tiu Co. The youthful Anson Co see’s potential height’s in staging intriguing International match-ups to delight fight fans through-out our nation of Philippines showcasing numerous prospects in different stables. The tie-up of well known Philippines promoter Sammy Gello-ani and manager of highly prized fighters Joven Jimenez is leading him to good start. The main event of their inaugural program will be World rated WBO #2 Flyweight contender Froilan “The Sniper” Saludar 15wins 0loss 11 knockouts that will be taking on veteran Jose Alfredo Tirado 27win 11 lost with 19 knockouts, Tirado has credited himself for defeating former world champion Christian Mijares and will be a sure test for Saludar. Also featured will be “Mighty” Mark Melligen 22win 3loss 15 knockouts against durable Thai contender Sapapetch Sor Sakaorat 28wins 10loss 18knockouts. Mighty Melligen is coming off from a spectacular one round knock out win against Don Don Lapuz at Misamis Occidental, Philippines on July 16, 2012 of SGG Sports Promotions. Gello-ani informed that with a win over Sapapetch Sor Sakaorat, their next plan is to get him a WBO Asia Pacific regional belt to have him enter the world ratings and possible shot at the world title that will be handled by Sampson Lewkowicz. A must see third featured main bout will be up-coming prospect “Pretty Boy” Jerwin Ancajas 14win 1loss 6 by way of knockouts versus Miguel Tamayo 12wins 3loss 11 knockouts of Sonora, Mexico. Tamayo is known as the knock out king at Sonora because of his knock out ratio, which surely be a delight match-up that will surely intrigue fight fans. 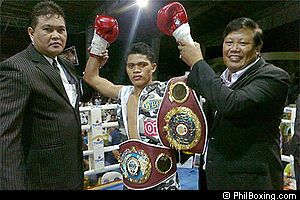 Last month August 16, 2012 at the Mandaluyung Sports Complex Ancajas was the talk of the town as he dispayed percision boxing skills to take apart prospect John Paul Bautista, stopping him on the 4th round via TKO, it was a sergical win for Ancajas that gave him this opportunity against Tamayo. Anson Tiu Co informed that he is looking into a long term working relationship with Gello-ani and Sampson Lewkowicz, indicated interest in promoting world title fight programs featuring Philippines best prize fighters in our home soil.